That solar generation of electricity thing again. Paul Homewood hits the nail on the head once more. Since Switzerland is currently expensively racing towards solar energy, Swiss readers of this blog should read Homewood's words and take note. For German readers it is already too late. Nothing changes. In times long gone we used to send children up chimneys to keep the heat going. 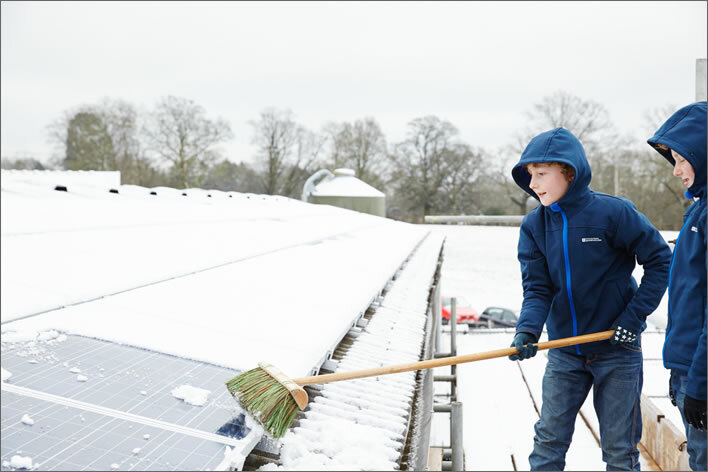 Now we send them up on to roofs to brush the snow off the solar panels. Image: Paul Homewood. 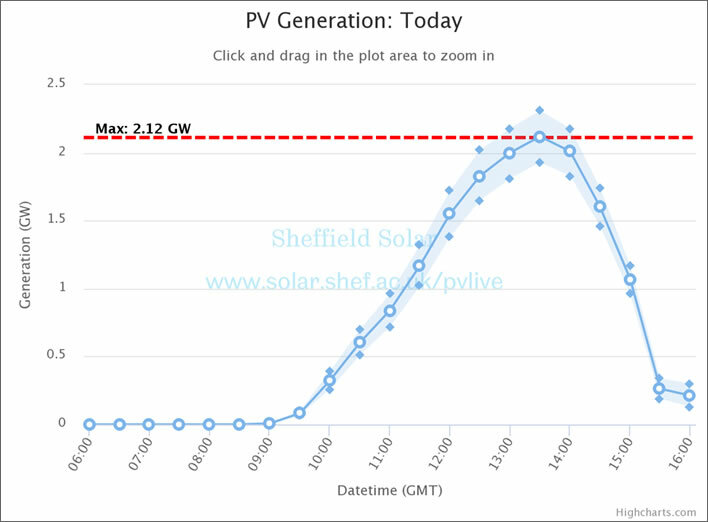 On a bright sunny day in mid-December in the UK solar generation kicked in at about 10:00 and kicked out again at about 15:30 – that is, five and a half hours of electricity generation. Substantial amounts were only generated in the three and a half hours between 11:30 and 15:00. Solar power generation in the UK on Monday 11 December 2017. Image: Paul Homewood and Sheffield Solar. The graph, grim though it is, is misleadingly optimistic: you have to remember that it covers only ten hours of a 24 hour day. The true representation would add a six-hour flat line from midnight to 06:00 to the left and an eight hour flat line from 16:00 to midnight to the right. Both lines completely flat. The pimple between them is your electricity for the day. Electricity during those 14 hours of flatness will be provided by Elon Musk's batteries, which will have been charged up by all the surplus power generated in the three and a half hours of productive operation. 'What surplus power? ', you ask. Good question. Consider your domestic consumption of electricity. For most employed people the household demand during the week occurs between, let us say, 06:00 and 09:00 and between 17:00 and 22:00. Both periods occur when the solar panels are producing nothing at all. People running factories, shops and offices should consider how their own power needs correspond to the solar generation peak. Not at all, is the probable answer. 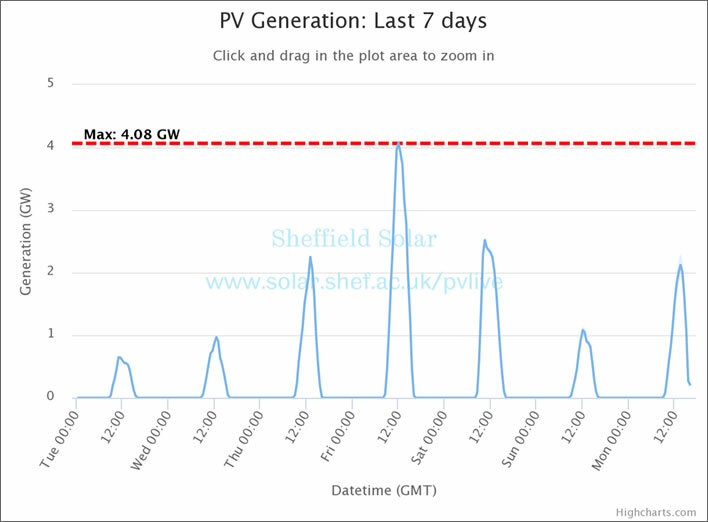 Solar power generation in the UK 05-11 December 2017. Image: Paul Homewood and Sheffield Solar. The first graph we looked at corresponds to the last peak on the second graph. Three of those seven days were not sunny, meaning that Elon Musk's batteries, if they ever get any 'surplus' power at all, will certainly not get any on those days. 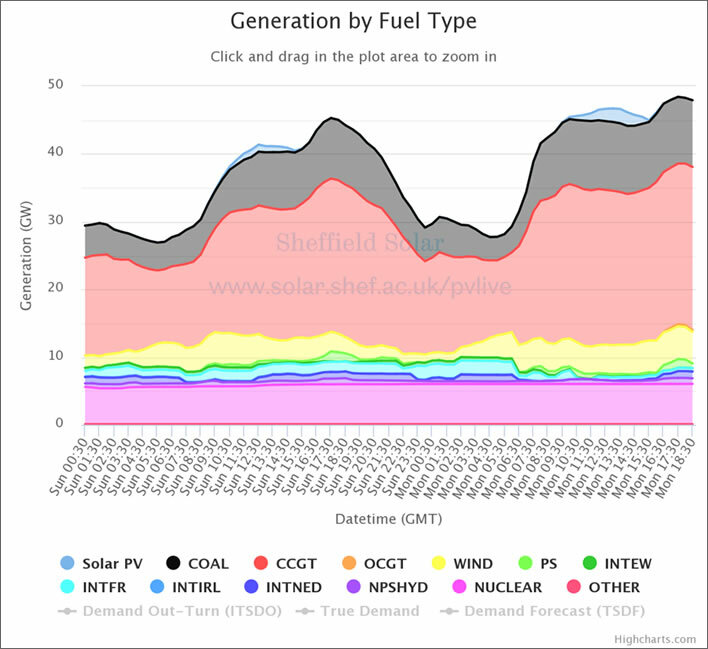 Electricity generation in the UK by fuel type, 10-11 December 2017. The two light-blue blips at the top are solar power. Image: Paul Homewood and Sheffield Solar. Fortunately for the population of the UK the generators of the coal, gas and nuclear power stations are still whirring. There is enough electricity even to charge your Tesla. The Swiss government, wanting to be better and cleaner than anyone else, will shut down their nuclear power stations soon. They are installing solar panels and wind turbines wherever they possibly can. Oh, and hoping that Germany keeps its reactors going and keeps burning the lignite and that France keeps its reactors going and that some clever person at the Federal Polytechnic works out how to extract energy from snow.